You can view the status of your GST returns via the ClearTax GST software on a real-time basis. ClearTax GST offers easy to import and download of GST data for preparation of GST returns. The best part is, you have to import the sales data for GSTR-1 just once. Based on this, the software auto-populates the details into GSTR-3B in a click of a button. Thus, with minimal manual intervention, avoid errors and ensure 100% accuracy in reporting of data. Stages in filling different returns. As a CA and GST filing consultant, there are multiple accounts you’ll have to manage on a day to day basis. 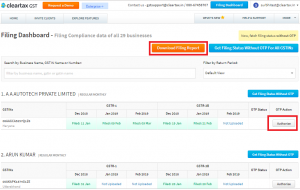 To be filed – if the returns are pending to be filed. Submitted but not valid – The return is filled and validated but isn’t filed yet. Filed and valid – The return is filed and found to be on par with the requirements. Filed and invalid – The return is filed, but the tax remains unremitted, either partly or fully. GSTR-1:- This return has monthly sales details, which will be filed by the 10th of next month. GSTR-3B:- In this return, the taxpayer gives summary details of sales and input tax credit. Taxpayers can determine the monthly tax to be paid in cash by decreasing the input tax from the output tax. The return must be filed by 20th of next month. GSTR-9:- This is annual return, which will be filed by December 31st of the year following the end of the financial year. 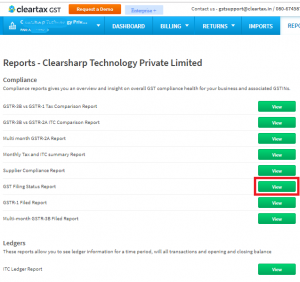 ClearTax has developed a utility which will help buyers to check the tax payment status of their suppliers and make claiming the input tax credit (ITC) easier. How to view the filing status? Step 1: Login to ClearTax GST. Step 2:Click on the ‘View Reports’ section against the business. A drop-down menu will appear, click on the ‘view all reports’. You will then be redirected to the ‘Reports’ page. Step 3:Click on View against the GST filing status report, you will be redirected to the ‘Filing Dashboard’. Then, Click on the button ‘Get Filing Status Without OTP’ to view the status of filing of different GST Returns like GSTR-1, GSTR-3B or GSTR-4. You can click on ‘Download Filing Report’ to get an excel version to share. Why should you know the status of GST return filling? It is important to know your GST return filing simply because GST returns filing can be done on time and thereby you can avoid Interest and penalties. The ClearTax GST software helps you efficiently and easily track the status of your reports. With real time-updates available on the ClearTax GST portal it becomes easier for any CA, GST practitioner or as for an individual to manage their return. At the click of a button, a user can fetch the data for the last three months of their filing status and take the relevant actions and avoid late fees and penalties.